Every year thousands of men get up early in the morning and head out to a ritual event in which they pit themselves in a show of machismo, testing their mettle against friends and neighbors, and challenging their physical stamina in a trial of bravery against the vagaries of nature. I’m not talking about the running of the bulls at Pamplona – I’m talking about charity golf tournaments. Yes, men who easily ignore the clanging of the holiday Salvation Army bells, men who brusquely dismiss the office request for five dollars to aid the pregnant mail clerk, men who complain about the price of a single box of Girl Scout cookies, will unhesitatingly write a check for an amount from a hundred to two hundred fifty dollars, call in to use a sick day at work, and spend six to eight hours in close quarters; half of it in trying to direct a 1-1/2″ ball with an oversized bent spoon toward a 4″ hole some 300 yards away – several balls, actually, because the leafy and poison ivy-filled woods and the muddy streams will collect a certain number of them – and the other half of the day drinking cheap beer, smoking mid-priced cigars, and eating high-cholesterol banquet food for the opportunity to let a small fraction of that money go to A Worthy and Noble Cause. Anyway, this golf tournament was run by a local businessman who decided that the Noble and Worthy Cause he wanted to support would be the Shriner’s Hospitals. Interestingly, perhaps significantly, Jim is not a Shriner, nor in fact, is he even a Mason. But he is aware of the wonderful work that the hospitals do, and felt strongly enough about this to want to undertake the thankless task of organizing a golf tournament. In that respect, Jim is a Mason who hasn’t taken his degrees. 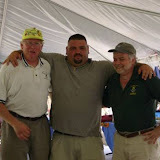 Anyone who has helped run a tournament for their lodge or business knows that this could easily become a full-time job: dozens of phone calls to sweet-talk local shops into donating raffle prizes, calls to the local course or country club to set up dates and times, calls to caterers to coordinate the food and beer, calls to friends who never manage to turn in the entry fees on time, calls to sponsors who forget to send in their contributions, more calls to explain to the course that not as many people are going to show up as anticipated, and the last minute discussion with the course when six foursomes show up who forgot to buy advance tickets. I give Jim full credit for the time and energy that he put in, and kudos for a well-run event, no less so it being his first time. And that makes it all the more curious that I found myself standing with him and the Most Worshipful Chip (former Grand Master of Connecticut) in front of four dozen guys and holding a check that should have been presented to a member of the Shrine. You see, like Jim, I’m not a Shriner, either. The story goes back a few months ago when Dave – the best Senior Warden on the East Coast – announced Jim’s tournament in lodge one night. Since Jim was not a Mason, I suspect that some of the lodge members didn’t take it seriously. Also, it was being held in the same week as another, larger golf tournament that is more heavily supported by lodges in my district. Dave and I, though, decided that we wanted to support a local effort, and indeed, between the two of us we supplied about one fourth of the players. At some point early in the process, Jim emailed the local Shrine and asked if he needed permission to hold a tournament using the Burn Hospital as a charity recipient, and asked for any other pertinent information. They never replied, and in all the rest of the planning, he had forgotten all about this. A week before the event, he was talking with Dave, and mentioned that he was surprised not to have heard from them. Dave (not a Shriner, either), called me to get some information. He figured that as the Master of the lodge, I’d know what was going on. Boy, is he going to be surprised next year. I didn’t have any info, but I had the numbers of a few Grand Lodge officers who were probably members, so he called them. He spent the next two or three days trying to get some kind of response from the local Shrine; he believed that it would have been courteous for a representative on hand to receive the donation, or certainly, at least a phone call to say “Thank you for your efforts, here’s where to send the check.” Dave managed to get Most Worshipful Chip down on Friday morning to play; Chip brought several small boxes of Shrine brochures, chatted with Jim and the other players, and at the end of the tournament, accepted a check for over $2,000 on behalf of the Shrine (of which he is a member, although not an officer). I’m still not sure why I was there, but I did take the opportunity to let people know about the great things that the hospitals do for children and burn victims. Chip augmented my statement with some facts, we posed for a few pictures, and sat down. Jim was happy, the players were happy, and I managed not to have to borrow a sleeve of balls to finish the game, so I was happy. Now, I’m not writing this to bash the Shrine. I sincerely believe that the hospitals are a wonderful thing, and they are a worthy cause to support. A few years ago the Shrine dropped the requirement that members be York Rite or Scottish Rite, and I’ve met quite a few Masons who joined simply to make sure that their dues went to supporting the hospitals. I know that the Shrine is having some financial distress at the moment, so you’d think that they’d welcome any donations, and would follow up on news of golf tournaments; and you’d think especially that ones run by non-Masons would be a curious enough thing for them to take notice. We don’t know what to make of this yet, except that apparently there is a Masonic group that’s even less organized than I am. Any of you that believe the Masons are behind the New World Order, please take note. My score, in case you’re interested, was -9. Oh, I don’t bother with all that counting of strokes and stuff, that’s for people who know what they’re doing. I count up the balls at the end of the day, and see how many have left. I lost some in the woods, a few in the ponds, and two on – I swear – black holes in the wide-open fairways. But I managed to pull up a few from one of the streams, so my score wasn’t as bad as it could have been. My party finished 20 minutes behind the previous group, and I suspect it was because I wasn’t the only one who spent more time looking for balls than in actually playing. Congrats on your golf game, and kudos on you and your friends’ charity-mindedness. And shame on your local Shrine Club for being so non-interested in your work. I noticed the “hospitals may close due to lack of funds” article you linked to is over three years old. According to reporter Sandy Frost, since that time many Shrine temples around the country have come under scrutiny because such a tiny percentage — 25% or less — of what they collect from charity events and buckets-at-intersections ever finds it way to a Shrine Hospital. See Sandy Frost’s investigative work. WS – Doh! Either I grabbed the wrong link, or I completely missed the date on that article. I’ve read Sandy’s 5 or 6 articles (courtesy of your own blog, thank you) and it certainly does seem as if the Shrine is having trouble keeping track of what the right and left hands are doing. Personally, as much as I love conspiracy tales, I tend to ascribe such inconsistencies to negligence, ignorance, or naivete instead of deliberate wrong-doing. We had a period for a few years when just about everybody’s retirement and stock portfolios plummeted in value. When you have more money, you simply have more to lose. I figure that I’ll keep my clubs in eh back of the car for a few more weeks, and then put them back in the garage until next year. I rarely bother my gift-from-God-Himself wife with the stuff I read online. You however write so well and with such a sense of humor that this evening I must bother the godess with the printed word. Having put on a few dozen charity golf tournaments over the year, I feel your pain. It is hard work, thankless work and sometimes the people you are doing the work for forget about how much work a charity golf tournament director has to do…but in this case it looks like they didn’t care. Too bad buddy, I with ya and let me know how I can help.